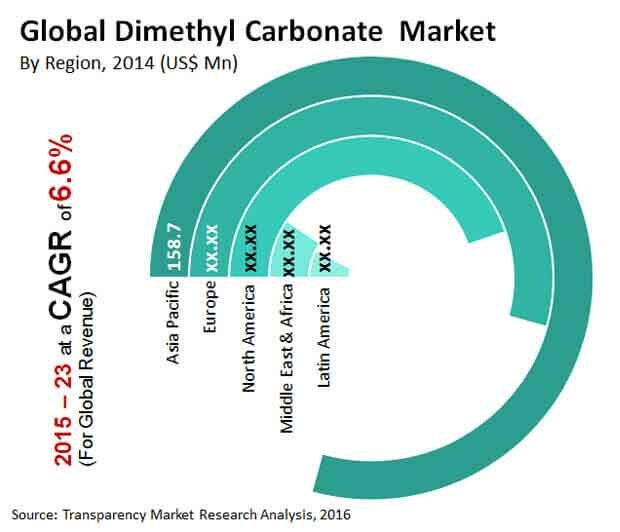 Presence of a copious number of players, both international and regional, makes the global dimethyl carbonate market highly fragmented. On account of being fragmented, the market is also highly dynamic in nature. Some of the prominent international players in the global dimethyl carbonate market are Akzo Nobel N.V. and BASF SE. Noteworthy regional players, mostly concentrated in the Asia Pacific region, include HaiKe Chemical Group, Dongying City Longxing Chemical Co., Ltd., and Tangshan Chaoyang Chemical Co., Ltd.
A report by Transparency Market Research finds that new entrants have moderate chances of gaining a foothold in the market because of the increasing demand for dimethyl carbonate. However, to taste success new players must be able to leverage strategies that would enable them to achieve economies of scale which in turn will help them realize substantial return on investment. To that end raw materials need to be procured without any disruption. The TMR report forecasts the revenue in the global dimethyl carbonate market to rise at a steady 6.6% CAGR during 2015 and 2023. Growing at this rate, the market is expected to attain a value of US$690.1 mn by 2023-end from US$440.6 mn in 2016. Volume-wise, the market is slated to reach 599.0 kilo tons by the end of 2023. Some of the key application segments in the global dimethyl carbonate market are pharmaceutical, polycarbonate, pesticide, and solvent, among others. Among them, polycarbonates are said to be the main engine for growth in the market and is slated to account for around 53.18% share by volume by 2023-end. The flourishing automotive and electronics industries are generating massive demand for polycarbonates and will continue doing so in the near future as well. Geographically, the main regions analyzed in the TMR report are North America, Europe, Latin America, Asia Pacific, and the Middle East and Africa. Among them, Asia Pacific is a dominant market for dimethyl carbonate in terms of demand. Europe trails Asia Pacific in the second position and is followed by North America in the third position. The market in Asia Pacific is primarily powered by the demand from China and Japan. The report by TMR predicts the Asia Pacific market to hold a substantial 49.26% of the demand by the end of 2023. At the forefront of driving growth in the global dimethyl carbonate market is the swift uptake of polycarbonates in different industries. End-use industries of automotive and electronics have exponentially driven up the demand for polycarbonates. Both industries are currently growing at a cracking pace and are predicted to maintain the momentum in the near future. Similarly, the paints and coatings industry, which is being boosted by the booming construction industry, is also considerably upping the demand for dimethyl carbonate. A factor posing headwinds to the global dimethyl carbonate market is the strict licensing policies pertaining to setting up of plants in different regions. “Currently, license providers to dimethyl carbonate producers are sticking to a restrictive licensing service. Producers of dimethyl carbonate are also having to pay top dollars for obtaining the catalysts and creating the perfect process environment. This makes it difficult to produce dimethyl carbonate on a commercial scale,” says the lead analyst of the report.